Through six weeks, the 2015 version of the Philadelphia Eagles can best be described as the equivalent of a bad internet dating experience. When we first saw Sam Bradford’s “profile pictures” (his initial play in the preseason), there was reason for optimism, but after the third preseason game against Green Bay, expectations of him became heightened and we became enamored with how much of a “perfect fit” he looked to be in this offense. Unfortunately, once the preseason ended and we saw the “real deal” (Bradford’s play in the regular season), it turns out that all those profile pictures were actually professionally done pictures…pictures that Sam looks nothing like in real life. Naturally, we shouldn’t expect perfection, nor anything close to it, but Bradford just doesn’t look to be “compatible” in this offense, an observation that surfaced once again last Monday night when the Eagles managed to defeat the Giants in spite of the play of their quarterback. ‘Tis a rarity when your team wins by 20 points over a division opponent and the fans exit the stadium feeling more perturbed than excited, but that’s precisely the feeling that Birds fans had after Monday’s night shellacking of the Giants. Such a wide margin of victory was due to the defense, which was considered a huge question mark before the season began, but has started to jell quite well under defensive coordinator Billy Davis. Unfortunately, the offense, which was considered to be a strong point of the team in the preseason, has been wholly ineffective at times, and inconsistent at best, mostly due to the play of their quarterback. On the plus side, the offensive line has started to play better and open more holes for the running game, but Bradford’s three interceptions all but negated any positive vibes the offense was starting to generate. 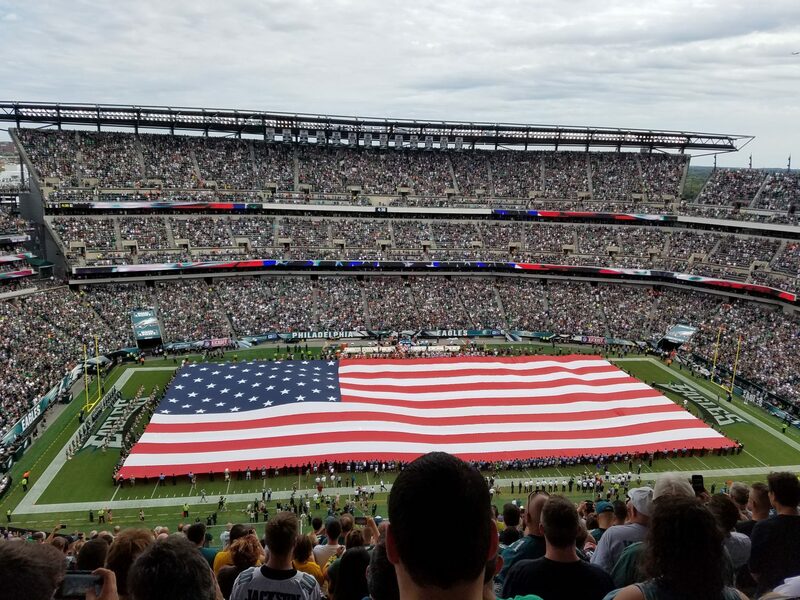 The general consensus of the fans seems to be that if we had played an opponent like a Green Bay or New England, both teams that the Eagles hoped to emulate before the season began, we would have been the ones to be blown out by 20 or more points. As the warmth of summer has turned to the chill of fall, the excuse that the quarterback is just “rusty” or is still getting acclimated to this offense will hold less and less water as each week goes by. It could turn out to be that Bradford is just not compatible for this team. But even after highlighting the struggles at the quarterback position, the Eagles find themselves at 3-3, which is a pretty good place to be when you were once 0-2 and 1-3. With what seems to be a weak division and a number of games coming up against less than stellar opponents, the Birds have an opportunity to still make their season interesting by going on a winning streak. That mission begins this Sunday night, when the Eagles head down to Charlotte to play the Carolina Panthers. The Panthers are a surprising 5-0, but in this watered down NFL which seeks to reach the pinnacle of parity, they are definitely beatable. The Panthers first five opponents have a combined record of 10-20 (tied for 3rd worst in the league), and even if you take out the five losses their opponents suffered to Carolina (under the guise that they lost to a superior team), their opponents record is still only 10-15, which translates to a winning percentage of only 40%. This Panthers team is probably overconfident after a win at Seattle last week, and is definitely due for a loss. The Eagles will face them at just the right time in my opinion, and while it will be a close, low scoring game that will still be in doubt at the start of the 4th quarter, I see the Birds prevailing, 20-14.